I'm sure some of you have heard of the World of Warcraft plague, but here's a recap if you haven't: deep within the sinister reaches of a land known as Zul'Gurub sits a creature known as Hakkar, the Soulflayer. Any adventuring party brave enough to defeat this angry god would be set upon by an infection known as "Corrupted Blood". Weaker characters would be killed instantly, while stronger characters would suffer until the plague ran its course. The infection was meant as a final check against characters that had no business being present for the kill, and to add a little extra flavor to the game world. Unfortunately, the denizens of the realm quickly found a way to corrupt the corruption. Players were able to move the disease outside Zul'Gurub by summoning in game pets at the site of Hakkar's corpse, thus infecting them. These infected pets were taken into enemy cities where anyone who came into contact with them fell ill and underwent an unplanned "strength check" at the hands of the Corrupted Blood. Avatars, all the way down to the lowliest of the lowbies, were ravaged and devastated by the plague that was specifically designed to kill them. In order to spread the plague further, shopkeepers and NPCs were used as secondary carriers. The game considered the non player characters open season for contracting the disease, but their status as a system asset allowed them to survive, perpetuating a cycle of infection. Many of these disease carriers served vital functions like armor repair, banking and item sales. Players needed to access these NPCs for vital services and fell prey to Hakkar's belated curse. The Archimonde server was the first to be hit, but several more followed as news of the exploit spread. Characters died in a rapid cascade, the weaker ones falling where they stood with the stronger ones managing to live just long enough to infect someone else before perishing. As each side organized runs to gather the infection to unleash on an opposing city, the plague became just another tool of factional warfare. Some of the infected players developed a mindset of shared grief, wishing to "take others with them" before expiring in game. All of the death and sickness quickly began to overwhelm the servers. Blizzard attempted to fix the problem by instituting a series of rollbacks to reset the servers to previous conditions, casting any uncooperative carriers into quarantine. It took quite a while before the plague was under control again. Now, why is all of this significant? Specifically, it was the first widely documented case of an unplanned viral outbreak in a virtual environment. None of what transpired was a planned test; there were no rules or contingencies in place to deal with what happened. This was a catastrophic epidemic compounded by its exploitation as a weapon of terror. Deliberate attacks were carried out by opposing sides in order to drop the corruption into a city. In the world of Azeroth, the disease originated from a freshly slain deity, but it could easily be replaced by Anthrax or Ebola in the real world. The situation only worsened when the "imminently dead" chose to infect and kill others before succumbing to the disease themselves. This madness transpired while authorities ran around like chickens with their heads cut off, doing what they could to cure an outbreak they weren't prepared to handle. Remember when I mentioned above how the game team had to resort to the drastic measure of resetting environments they couldn't salvage through conventional means? Take a moment to consider what that would entail in a real world situation. People beyond the gaming community took notice of this event. The BBC made it a major news story, doing several pieces on it. National Public Radio did segments concerning the cataclysm's effects. The Center for Disease Control was knocking on Blizzard's door for their records on the spread and control of the their "virtual plague", hoping to glean whatever information they could from the data. In our reality, such a conflagration would be catastrophic and health authorities would respond quickly and with purpose. In World of Warcraft, on the other hand, they were able to see what occurs when such an event runs its course, without the worry of permanent loss of life. Computer security firms and organizations that provide information and analysis on military and terrorist threats latched onto this story and scrutinized it for the sociological and political ramifications of the biological warfare during Hakkar's revenge. Many psychologists stood by and watched as this malady ran rampant and drew parallels to real world examples of similar situations. They studied the events with equal parts fascination and horror as the scenario unfolded. Sure, this was a trivial occurrence, with Orcs, Elves and Trolls paying the toll for "man's inhumanity to man". This wasn't an intentionally complex controlled simulation; it was simply a bunch of people who were suddenly faced with a new situation. It was a simple set of parameters introduced into a previously static environment. What made this event stand out was the number of players that became involved. It was the dynamic interactions of personal and factional motivations that pushed the infection to critical levels in a way that would make the Joker giddy. People and organizations outside the gaming community were observing WoW. They were discussing the game and learning from it. In the wake of the Plague of Hakkar, all of these outside parties began to take a more serious look into running more involved simulations in virtual worlds. Computers have been used to test theories and prod at problems before, but this was the first time genuine human involvement was part of the equation. More people are realizing what many gamers already know: these aren't "just games". The Institute of Museums and Library Services is one group that has taken notice of the MMO phenomenon. The IMLS is an independent organization of the United States government dedicated to creating and supporting storehouses of information and culture. They are the largest source of federal support for collections of media on a national level. The IMLS doesn't just assist major data stores, they research and develop the methods for cataloging and maintaining them. 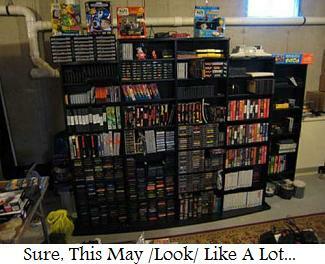 Their newest project is the proper preservation and accumulation of videogames and their lore. Are videogames art? It's a question that's launched a thousand flame wars. Everyone has an opinion on the matter and every point raises several disputes. What can't be disputed, is the growing impact of video games on our global culture. Games are now a means to convey ideas and entertain people as much as books and movies ever were. Sure, we get our fair share of "Space Marine" shooters, but like every medium there's a healthy ratio of fluff to truly groundbreaking or high-quality products. Entertainment software's power and allure stem from the freedom you gain while playing. In a video game, you're free from society and its restrictions, allowing you to be an entirely different person acting under a completely new set of rules. These open situations sometimes include the freedom to do "the wrong thing". Not everyone is going to remain a perfectly law abiding citizen if consequences are removed. Sometimes players purposely act bad just to see how it feels. Games like the Objectivist showpiece Bioshock present the duality of morals as a part of the narrative. Participants in the story decide how the tale changes by making the choice to go beyond normal societal constraints. The freedom to disobey laws and wreak havoc is exactly what makes software like Grand Theft Auto so scary to parents and watchdog groups. 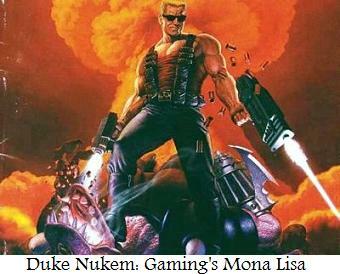 The Institute of Museum and Library Services attempted to chronicle the legacy of videogames as a means of recording the birth and ascension of a major medium. Gaming suffers the stigma of being "teh devil" and are responsible for all of societies ills, just like movies, music and even books were in the past. The general position of society shifts as new generations grow into positions of power. The IMLS views this change as another cycle in human anthropology and wishes to record it from its grass roots on up. They hope to save what has come before from the ravages of time, entropy and moms who clean your room when you're not home. 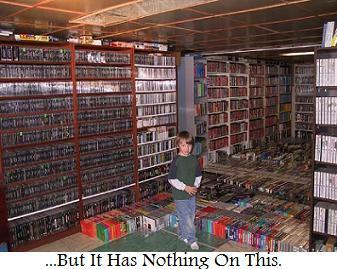 Several collections of software and consoles have sprung up at colleges and universities nationwide. The Library of Congress put out an open call for any artifacts (manuals, games, recorded lore, etc.) about games, going so far as to establish a new wing for whatever it finds. Storing Dreamcasts and racks full of static software is easy enough, but what happens when the history you are trying to preserve is something meant to be fluid and changing? MMOs are meant to grow with their players. There are countless people on at any given time, generating thousands of stories and millions of "You had to be there moments". People with full lives and no lives create whole new lives in these pockets of existence. And what happens when a game closes and the servers go dark? If an MMO folds, everything a player did is gone. Unless they took screen shots or video, they have nothing left but a worthless disc and the memory of time spent. The major challenge of saving such a fluid and dynamic evolution is the very fact that so many hours dedicated to a task can disappear like documents off a crashed hard drive. The MMO cataloging project has fired its opening volley. The University of Texas' Austin School of Information has received a $250,000 grant from the IMLS for research collection and preservation. ASI says it's developing self-contained server networks that will exist as miniature shell realities. Each cluster will run different versions of MMOs. Online games can change dramatically from expansion to expansion, patch to patch. Careful archiving of each build is also in the works. The scope of the project goes well beyond just hardware and software, according to University of Texas assistant professor Heather Winget. Another part of my research is to collect oral histories from gamers and game developers regarding their experiences playing games, specifically during "epochal" moments, like when Lord British was assassinated in Ultima Online. Some people also happened to record those moments, and it would be very interesting to collect those artifacts for the cultural record." Just think, the next time you and your guild are fruitlessly grinding away at some raid boss, there could be a representative from the MMO project on hand to copy down every swear word and cry for mercy.